You can dilute the baths with water, pray over them, and they will go far. The above herb mixture can also be used for dressing glass-encased candles or for rolling free-standing candles, or incorporated into a protective floor wash. So are you saying its necessary that our wives and kids MUST take the bath? I want to be specific. We dont want a situation where we may think some people within the family still has the cross/hex. Does a spell meant for us, the children of Mr & Mrs X, still remain with the wives and kids of Mr and Mrs X kids even when their husbands/fathers have cleansed? Just to make it clear, you can have the wives and kids to take the bath. Anyone who is bathed is cleansed. Anyone who is not bathed is not cleansed. It is an actual bath. But as Ernie mentioned above, you can use the Protection Herbs to brew a tea to make a floor wash, and wash he house out, and especially the floors, and that will help protect everyone within the dwelling. Can you combine fire wall of protection with tranquility? My bf has an uneasy feeling when he visits his daughter at his ex’s parents house. He doesn’t have the feeling when they meet up at a ball place or park but when he goes to the home he feels uneasy with anxiety and feels as if he is being watched (ancestors?). Any suggestions would be great. I suggested a reading but because of a tight budget we would like to do a spell. I believe you could do that, yes. You could do some Fiery Wall of Protection candle work, and then have him wear dabs of the Fiery Wall and Tranquility oil when he goes to his ex's parents' house, that way he can get the effects of both. After i made all spells, i want to protect me, my home and my pet from all bad things. So not sure if there are rules. I want then burn fiery wall of protection fixed candle. Sprinkle fiery wall of protection sachet powder to doorstep, that only good things can come in. Inside apartment sprinkle peace water in all rooms in all 4 sides. And using chinese wash to clean floor inside, and outside the apartment for stairs. Do you think this is enough? ... or too much? the work you stated sounds great, you can also dress yourself with fiery wall oil. After you cleanse a room set a white candle in the center dressed with peaceful home oil to make things nice at home. You can also dress windows and doors with powders or oils, or wpe them down with Peace Water. I keep a wreath on my door and I stick items like devils pod in it and dress it with protection oil. Great suggestions from j82. I love the wreath idea! ....because i thought if order fixed candles, i need no oils. But i forgot, that maybe need sprincle myself. The dressed candle will come with the oils and herbs dressed and ready to go. I still like to have the oil or powders around me to back up my work or candle. Example: While I burn this candle I would dress with the oil. I would dress a charm, tailsman or mojo I wear for protection. Peaceful water keeps you and the area peaceful not exactly a protective quality. You can probably call the shop and see if you can simply add the oil to the order and pay the difference, oil is 7.50 a bottle. Would a white candle anoited with Protection oil and cascarilla powder be a good protection spell? And also a bath and floor wash made up of bluing, sea salt, and cascarilla? Along with burning Protection incense after I am done the floor wash and bath to top it off? Well y'all,I'm looking at getting hit by Hurricane Florence this weekend.Any suggestions on hurricane protection conjure? I have made offerings to Oya in the past for protection with great success but I'm wondering what folks on this forum have to say.Thanks! I hope you left the area for safety! I would pray for safety, call on St. Michael for safety. Have a candle set on the church for protection during this time. Take all the protective measures possible to stay safe. Hoodoo helps but we still are responsible for the mundane work as well. Jaydee- I appreciate the comments about the mundane world,but my whole family is filled with medical professionals ,a sister who does emergency management for disasters around the world and first responders.I am a registered nurse who has been caring for evacuated patients from hospitals by the coast all week. We have a generator for home and farm, 100 gallons of water,food stores and are otherwise impressively prepared. Assume nothing,darling. I was asking for conjure advice,not dodging reality. I did not make an assumption I answered a question on your poorly stated question of " how do I get protection from a hurricane" a general response as I gave you to pray st michael and do mundane work is accurate. This forum is also not just for snouvavou as many people come here and read the advise from those on the web page and will read post generating back almost ten years. Please do not assume everything is about you in a post. IF you want some hoodoo advise on storms feel free to read the free resources at your leisure or order a book wrote by a LM AIRR member. Hope this helps with your request for assistance in hoodoo work. I require aid from the great rootworkers at Lucky Mojo, and this forum. Recently, I'm on vacation and visited two major tourist cities such as NYC and Rome, Italy. This is not about how much fun I am having in those cities, it is about the amount of scammers I had encountered. Here are some stories. While I was in NYC, I was walking down the street, suddenly a black guy that was passing by are handing me a CD. I had faced similar situation before and didn't take the CD. The CD dropped to the ground. The black guy told me to pick it up, which I didn't comply and continued to walk. Then these four other black guys just magically appeared in front of me and all yelled at me telling me to pick that CD up. Of course, I didn't comply and kept on walking. I see their tactic was, once you take the CD, the guy will demand money from you, and if you don't take it, they will embarrass you in the street. Also, if any of you been to Time Square, you'll see those "entertainers" in costumes. I had been approached many times from those people. They will try to shake your hand, and if you shake their hand, other nearby costumes will surround you, and force you to take a picture with them. Then they will demand money from you. Right now when I see one approaching me with their hand out, I just kept on walking and ignore them. These are the two scams I faced in NYC so far, but I say the ones I encountered in Rome, Italy is even more annoying. One of the scams you'll encounter in Rome is an African guy approaching you, pointing toward your shoes, and says "nice shoes!!" with a smile, they'll try to build rapport with you, and later demand money from you. I encountered a LOT of them, so I just give them the cold shoulder. I once ignored one of them, the African guy didn't move in place, he stood there and tried to use his hand (with the pointing finger to my shoe) and attempted to block me. I kept on moving, and the guy actually got physical, and used his hand to poke my stomach. I told him "no" and kept on walking. Another one is the rose seller, they'll look for couples, and give the female a rose, then they stalk you and demand money from the husband. If the couple refuse to give money, the guy will make the husband look bad by trying to take back the rose. These are only a few examples, there are a lot varieties. You guys can google it to view even more. Now for the magick part, what formula would you all recommend to protect myself and repel these scammers? I'm sick of them. Good grief, how annoying. Well, I think good ol' protection work will help you here, as well as a trick to help to up your "invisibility," or the ability for you to be noticed by other people. Carry a big of agar agar powder in your pocket or in your hand, it will help you walk through unseen! Does Lucky Mojo sell the agar agar and can I put it in my pocket as it is in its original packaging? Lucky Mojo doesn't sell agar agar, but it's mentioned in cat yronwode's "Hoodoo Herb and Root Magic" and it's readily available online. As for keeping it in its original packaging, I suppose that depends on how big of a package it came in. I'm sure you could fold it into a packet if you didn't want the powder to get everywhere. I have a friend who was raped years ago and her PTSD has resurfaced recently. She has become obsessed with personal safety and would like to get past this obsession. As an example, she currently keeps a knife, mace, and a tactical flashlight in her purse and is constantly researching new items to buy. I would like advice on what she can do to both feel safe and get past the obsession with feeling unsafe. I plan to give her some of my Fiery Wall of Protection oil and some Devil's Shoe String to put under her door mat. Maybe some Peace Water to spray on her pillow at night? I was thinking maybe she could also pray to St. Dymphna to heal from her PTSD. I might order a St. Dymphna candle for her at MISC. I am so very sorry to hear about your friend. That is awful. I have a very dear friend who carried a heavy metal candlestick around in her purse for years in case she had to fend off an attacker again. I think petitioning Saint Dymphna is a wonderful idea. She has a beautiful chaplet you can pray. I would also think doing some cleansing, Healing and Tranquility work for your friend could help. Bathing in these products may help remove some of the residual lingering trauma from her experience. Thank you bythebeautifulsea! I'm going to LM tomorrow, so I will pick up some items for her. She's doing a little better the past few days because her psychiatrist tweaked her meds. Gotta attack these things from all angles, mundane and magical. Maybe some St. Dymphna oil to add to a 13 Herb Bath. I wonder if St. Dymphna oil has a lot of the same ingredients as Healing and Tranquility oil. I know the ingredients are proprietary but just wondering if it can be substituted. The oil will be made to the directions of petitioning the saint and used to dress the work when petitioning the saint. I would use healing oil because it has specific herbs with the magical elements in it that would bring fort healing. I would not add the oil to the 13 herb bath, as the path is taking it off of her, I would add uncrossing, cast off evil or even cut and clear. After the bath dress the body with the oil, it can be mixed with a carrier oil, or mixed into a lotion and applied to the body while praying for healing. Psalms 49 and 50 are used for healing as well. That makes a lot of sense. I'll give her a blend of Cast Of Evil and Uncrossing oil to put in her bath. I'll make her a blend of Healing and Tranquility oil to dress herself with after the bath. I like the idea of putting it in a lotion. Does LM sell empty oil bottles that I can use to give people oils and oil blends (as opposed to giving them the whole bottle)? I'll tell her about the Psalms as well but she's a recovering Catholic so she may have an aversion to anything from the Bible. Thanks so much JayDee! You always have the most helpful responses. LM does sell glass bottles for people to make their own oils, or to blend oils. You can also order a church special of oil and they mix it for you. I understand she may not like the Catholic aspect, but the Psalsm are actually jewish and there is a long tradition going back to the jews of using them for various needs. I would add all heal to the jar you give her, and also consider angelic root wrapped up or in a mojo for protection. Thank you I am glad I am able to help! Apologies as this may have already been answered in the thread but my 15 year old niece is visiting this week for the holiday and I’d like to add some sort of amulet or protection oil to her purse without her knowing. I worry about her as a teenager of course and want to take advantage of the fact she’s in my home right now and trying to find the best course of action. This topic isn’t usually my forte so any suggestions would be great! 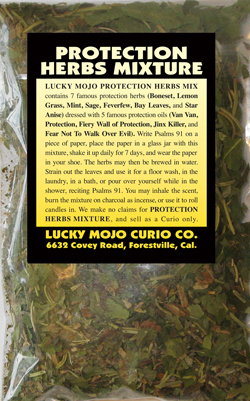 I have lucky mojo protection oil and powders. Thanks for your any help! I’m also interested in products that may be more specific to me adding protection to her discreetly. 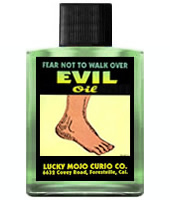 I swear I heard a lucky mojo hoodoo root work hour mention this previously as well. Late night post as she finally just fell asleep and I want to be slick they’re here all week. Thanks again! Always appreciate the input here! While she is staying with you, you can add some of the protection oil to her body wash pray over it, each time she washes it will place it on her body. You can buy a body lotion and mix some of the oil in as well. I would dust the inside of her purse with the powder and the buttons of the purse/zipper with the oil. Pray over the bag. I have young nieces and nephews and I purchased them jewelry which I prayed over, dressed with oil and burned a candle on top of the item before giving it to them. You can also take the jewelry from her when you see it and say you are going to clean it, then dress with oil again. Some items that I have used is a st Michael charm or bangle bracelet, a cross, hand of Miriam, St Christopher for safe travels. A saint Michael card to carry in her purse. You can also start burning protection candle on her, either a 7 day candle or buy a figure candle, dress it with protection oil and powder and burn it on top of her personal item ( like hair in a name paper). I was in an accident over the Thanksgiving holidays but it was a minor hit to my car. Anyways, the officers came and took our information, but he states I did an improper lane change which was not true. One of the officer knew the party in the other car but tried to play it off after I noticed her asking about his relatives. We were given warnings, however they reported a claim against my insurance but has not returned my claims rep a call to give their side of story. The case will be open until they return a call to my insurance which I think is ridiculous if they aren’t returning the call according to my claims rep. Also, I feel as my claims rep is believing the report and even though no one received an actual ticket only a warning, he makes it seems as though my issue may increase or I could be dropped. Remind you this is a company that supposed to be forgiveness for first time...My record is clean so I’m confused as to how my insurance would increase on warnings to all parties and my rep doesn’t appear to be in my best interest either. Any suggestions on things work in my favor and th other insurance to fix my car? My rep should work with me not against me...he has no info from other party and the police report is not true! In addition you may want to wear stop gossip products to silence them and their lies, and I can you cant oil to influence the people so you win over them. Placing your agents name in your shoe and tapping it as you talk to them is a method to help influence them and their thoughts, to put pressure on them. Thanks JayDee...it appears that I am a target when driving and in general. I always annoint my car with safe travel and protection oil, Florida water as well. I have a bag that I made with different herbs etc but I still always come in contact with rude aggressive drivers and mean people in general. Any suggestions on how to come across people who are positive and less aggressive? Any suggestions on How to make people more pleasant to me? I ask this politely but is their anything you are doing that causes it? If you can rule yourself out as a force that is bringing this out of people, then I would move into the next step of that maybe a jinx is on you and the car. I would wash the car and smoke the inside down. You can make a safety packet and keep it in the car, and add items to it to not only keep you safe bat calm and nice people, I would use angelic root, white clove for sure to the bag and dress it with protection oil. Maybe go with protection and not fiery wall as fiery wall really destroys the evil and is a strong blend, protection I think more like an angel over you and being unnoticed by the evil. Dress your tired and car with protection oil. I have an evil eye charm on the window mirror and a hand of Hasma on my keys I dress weekly with protection oil as well. And just like anyone else, I’m not going to allow anyone to bully or disrespect me. I am glad you are not part of the issue. Since you can rule out mundane issues then look into the spiritual aspects. Here is a list of many sources to support you on the forum and LM.If you feel you need further support other then general recommendations made on the forum you can contact AIRR and have a reading where they can discuss any curses on you, spell work and specific protection that would meet your specific case needs. So my daughter was doing good for a while and her and her " bully were getting along really well. This past weekend the bully seemed to be back at it picking on her and getting her friends involved. It wasn't physical but it is mostly picking on her soccer skills but my daughter is hypersensitive with this girl so it goes from 0 to 1000 in a blink of an eye. She will not pray or use oils but I wanted to be sneaky. I already oil her hair 2x/week and I use attraction, love me and follow me boy and girl. I also put it in her lotion but not much happening yet. I did pray over the oils psalm 23. I oiled all her jewelry but she doesn't wear it much since she does play soccer a lot. 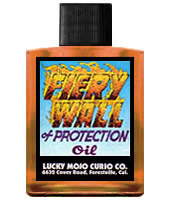 My question is should I use cast off evil and fiery wall of protection in the hair oil instead of the attraction to see if it work better? For bullying I would use fiery wall oil or protection oil. I would also add stop gossip so the girls and others will not hurt or effect her. May add Crusible of courage oil to her to give her more confidence. Pray over the oils and read the psalms. Ok so I can mix the fiery wall, crucible of courage and the stop gossip and put the oils in her hair when I oil it? Are they ok to mix together? Also my go to psalm is psalm 23 is that good? If your goal is to protect her from bullying, use the oils intended for Protection. Do not mix oils intended for different objectives, as you are confusing your work. Keep it focused and single-minded. You can put a tiny drop or two of oil into her shampoo bottle, shake it up and when she washes her hair, she will get the product on her. When you wash her clothes, dissolve a small amount of the bath salts into the final rinse. When she wears those clothes, she will be spiritually protected. Do separate work on her to enhance her courage if you wish her to have more of it. Use Stop Gossip on the bully, if gossiping is at the heart of the problem. You can search the forum for threads on those topics for more advice and information. Keep your goals focused if you want to see the result of any individual working. I can't stress the importance of this point enough. Ok so just to clarify because I am getting 2 different answers. Fiery wall and crucible of courage is ok to mix and then put in her and put it in her hair( she has fake locs put in and we can't wash with soap and water,we use pillows and spray shampoo). As for the stop gossip, that needs to be done separately and somehow put on the bully. I can search the forum for that but just making sure I am right. I would not mix those two oils because they serve two different purposes. Fiery Wall of Protection puts up a shield in your environment so that negative energies do not hit you. It is directed at external forces that are potentially coming at you from the outside. That is, outer-directed. Crucible of Courage is intended to improve your personal determination and bravery. That is, it is inner-directed as it works on you from the inside out for enhancing a personal characteristic. You may indeed have a compatible goal such as wanting to work on improving your courage in facing outside threats, but you would still work with Crucible of Courage itself for that purpose. Leave the protection work independent as it is a separate goal against outside energies. You will find that you may get multiple answers to your questions on the forum, and sometimes those answers are contradictory. We have qualified moderators on the forum who provide expert advice from their extensive knowledge and education, including graduating from Miss cat's course in hoodoo and rootwork and years of practice. You will know us by our avatars and names in green. In addition to answering posts ourselves, we follow up on other peoples' responses to ensure questioners are being guided appropriately. Often, other forum participants and students will answer posts too, and you will know them from their avatars as well. Whose advice you choose to take is up to you. I just thought of a great idea for the oils. I will put crucible on her hair like I said but for the fiery wall of protection I will put a few drops on dryer sheets and out them in her car, shoes,soccer bag, cleats , and her school bag so she will always be protected.yeah me!! Also just a thought can I mix cast off evil and fiery wall? Yes cast off evil will toss off the evil people, and actions, break the chains of the form of evil in this case people. Then protection will keep her safe from them. My mother has a small property she was renting and the tenant stopped paying the rent. After a legal case the tenant has now been ordered to leave the property and if they dont then debt collection will be getting involved to recover the money. Will a fiery wall of protection be good to be done on the house so it is protected from any damage done by the tenant in malice? Petition will read - (address) is protected from all internal and external damage, malice or harm. Would this be ok? You can burn a candle to protect the house, and state the home owned by ( moms name) is protected against the evil and destructive actions of ( people living in it). Normally, a Firey wall of protection is usually meant to protect people from other people or even spiritual entities from doing harm against another. I've not really heard of it being performed to prevent damage to properties although I would think that this would be okay. I will say though, from a practical standpoint, if the old tenant is already facing possible debt collection I doubt seriously they'd do anything else to make more money problems for themselves but hey, ya never know. I would use a white candle. So my boyfriend and I are in a situation. My boyfriend just recently quit his job working for a friend and moved back home, about 3 hours away from me, to start a new job next month. The friend has been acting crazy and threatening us. My boyfriend has known this guy for over a decade and he has been trying to get away from this guy for two years. I’m being told I have nothing to worry about but I seriously doubt it. Is there anyway I can protect myself and my boyfriend from this guy or any type of harmful evil? We’re just trying to better our lives so we can build our future together. This will keep him from any negativity that this guy might throw at him. Also, have him lay a thin line of brick dust across the threshold of his room, to keep that guy out of it. I hope this helps. Good luck to you and your boyfriend. Hope he gets out of that place soon. Unfortunatley he’s not open to protecting himself spiritually but I am. Is there a way I can help protect him from afar?